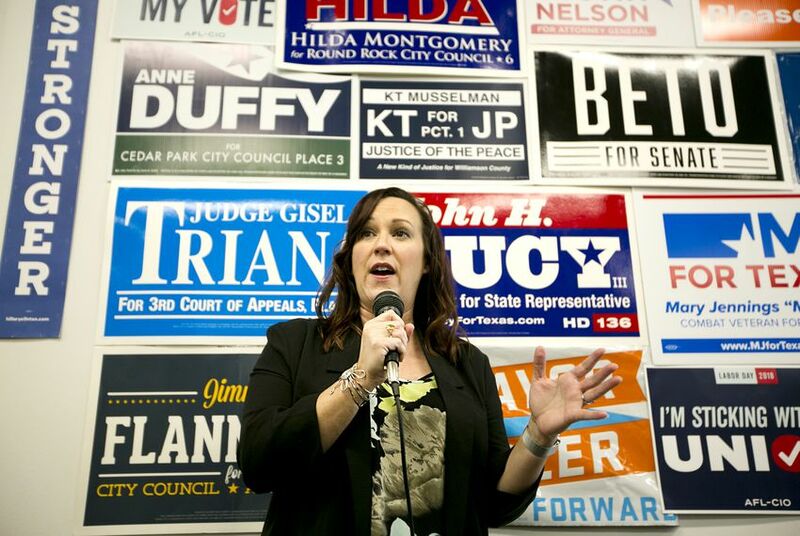 WASHINGTON — Military veteran MJ Hegar, a former U.S. House candidate, is seriously considering a run for the Democratic nomination to take on U.S. Sen. John Cornyn in 2020. "I'm not closing the door on anything," she told The Texas Tribune on Tuesday. "I'm considering my options and weighing what's best for my family and how to best serve my community," she added. "I'm aware that I have assets. ... I'd like to put those assets to use for my community." Those assets include her staggering fundraising capacity, as evidenced by her failed House race. Thanks to a viral biographical video, Hegar became a fundraising juggernaut and came within striking distance of winning a historically Republican seat. While she came up three points short against Carter in November, she raised more than $5 million for her challenge against the longtime incumbent, an astronomical sum at that level of politics. Carter won his previous race in 2016 by 22 points. Hegar is also considering a rematch against Carter. But for now, she's working for Hippo, a technology company that aims to help patients secure low-cost prescription drugs. Cornyn, by all accounts, is taking his re-election for a fourth term seriously. Former Texas GOP Chairman Steve Munisteri returned to the state from his post at the White House to help with the effort. And Cornyn finished his most recent fundraising quarter with $6 million in cash on hand. For her part, Hegar said one thing that might factor into her decision is whether former Democratic state Sen. Wendy Davis jumps in the Senate primary. Davis told the Tribune on Tuesday she has not "ruled anything out." "Wendy is someone I respect a lot and I support a lot," Hegar said. "And if she were to decide to run, I would be very hard to convince to enter a primary against her."